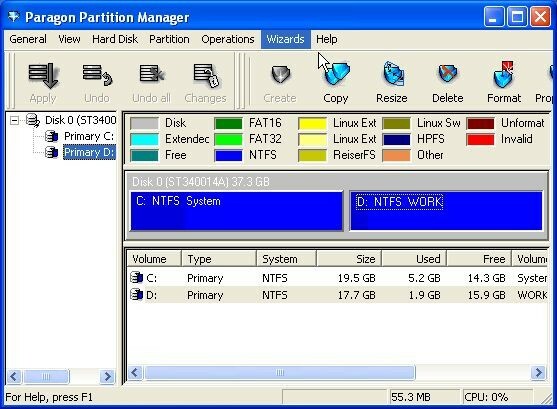 Paragon Partition Manager (Personal) 7.0 is file & disk management software developed by Paragon Technologie GMBH. Every PC owner sooner or later meets a task of hard disk management. An optimum allocation of disk resources is the key point to manage data and operating systems on your computer effectively. Paragon's award winning Partition Manager provides easy and reliable hard drive partitioning and full-range hard disk management. It enables to create, copy, resize and move hard drive partitions. Paragon Partition Manager (Personal) 7.0 supports English interface languages and works with Windows 98/XP/Vista. Latest Paragon Partition Manager (Personal) 7.0 does not contain any spyware and/or advertise modules, allowing installing it with no worries concerning valuable information loss. We has completely tested file & disk management software Paragon Partition Manager (Personal) 7.0 many times, written and published the interesting article and uploaded installation file (7146K) to our fast server. Downloading Paragon Partition Manager (Personal) 7.0 will take minute if you use fast ADSL connection.